If you have recently formed a Private Limited company and started your business, you must get yourself familiar with few important compliances by Companies Act 2013. Normally, we tend to leave such things to our legal experts but its always good know the basics. 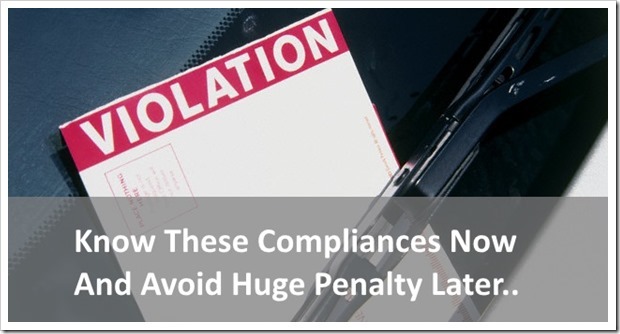 We have listed down 5 such compliances that are easy to miss out but can attract hefty penalty. 2 2. Displaying Company Identity – CIN on letter heads, invoices etc. The company formation document “Memorandum of Association” has an “Object Clause” which defines the business company undertakes. Before April 2014, a simple resolution with consent of Board of Director would have sufficed to undertake any other business activity beyond the coverage of main object clause. How to comply: Now, with effect from 1st April 2014 all such Companies who were/are carrying of activities other than principal business activities as mentioned in the other objects are required to alter the main objects and include such activities therein. Consequences: If the provisions are not complied, such business activity shall be treated as ultra-virus. Consequently, owing to multiple business activities, the Companies may also be required to change its name. I am sure you will go back and check the “Object Clause” in “Memorandum of Association” document and see whether the business description is correct ! 2. Displaying Company Identity – CIN on letter heads, invoices etc. How to comply: Section 12(3) (c) of new Act provides that every company shall get its Name, Address of its Registered Office and the Corporate Identity Number (CIN) along with telephone number, fax number, e-mail and website addresses if any printed in all its business letters, billheads, letter papers and in all its notices and other official publications. Consequences: In case of any failure to quote the CIN number, penalty of Rs 1,000 per day shall be imposed on the defaulting company and on every officer in default for every day during which the default continues. However, maximum penalty imposable shall not exceed Rs 100,000. Majority of Private Limited Companies accept unsecured loans from Director’s relatives or from its members as allowed under the provisions of Companies Act, 1956. As per Companies (Acceptance of Deposit) Rules, 2014 applicable from 1st April 2014, all such Companies now have to refund such unsecured loan/deposit immediately. As per the provisions, the Companies can accept unsecured loan or deposit from Director of the company provided further that such amount is not a borrowed amount and can accept inter corporate loan(s) from another body corporate and not from any other person. How to comply: As per companies Act 2013, if the private company has accepted any loan from any person except director, then they need to file a statement in prescribed form with the Registrar of Companies (RoC). Consequences: The Companies which fails to refund such unsecured loans already accepted from Directors’ relatives or members immediately shall be treated as deposit and as a consequence, defaulting Companies and its officer in default may face penalty/prosecution proceedings under the provisions of Section 73 to 76 of the Companies Act, 2013. As per the new act, the company must comply with certain provisions while dealing with deposits taken from public. How to comply: The Companies which have accepted deposit from public were required to report outstanding deposits, interest thereon by filing a return with the office of Registrar of Companies up to 30th June 2014. These Companies have to refund the outstanding deposit with interest within a period of one year i.e. on or before 31.3.2015. How to comply: Now, the private Limited Companies which have borrowed money in excess of its paid up capital and free reserves are required to pass special resolution and members have to decide up to which limit the Company can borrow. As per provisions of Section 180 of the Companies Act, 2013 every such company has to comply this provision immediately. Consequences: Upto Rs. 10,000/- fine and where the contravention is continuing one then a further fine which may extend to Rs. 1,000/- per day after the first day. Prevention is better than cure! All these things might sound like greek or latin to you but it will be a good idea to check Ministry of Corporate Affair’s website once in a while to know the latest updates. Companies should be aware about the basic compliances and take necessary action with respect to restructuring of Board of Directors, allotment of shares, acceptance of deposits, reporting major activities to ROC etc. Also, using a good accounting software from day 1 of starting up the business can help you manage most of these things without much effort. I think there had been an amendment in September 2015 that loans can be taken from relatives of directors. Please clarify. Yes, as per Rule 2(c)(viii) of the Companies (Acceptance of Deposits) Rules, 2014 the loan taken from someone who at the time of taking such loan was a director in the company or a relative of the director is allowed subject to certain conditions. Condition being that the Director must declare that such loan has been given out of private funds and not borrowed. i want to open a new private limited company. whose works in take deposit as rd, fd, dds etc. types and give loan assecured & unsecured . can i do it . would anyone elucidate point no. 3. Lets say, i m the director of my Pvt. Ltd. Company. So can i borrow unsecured loan from unknown person (not relative) & further i m using it in my company? If not, then how can i arrange capital? well i have invested my money in some Pvt. Ltd. companies. So is there any method which can allow me to invest in pvt. ltd. companies? Is there is any new amendment that a private limited company turnover of 50 crores per year can buy unsecured loan? Pl clarrify. Sir, can a private limited company accept secured and unsecured loans from its directors? Taking deposits from public was allowed for PVt Ltd companies before Companies act 2013 and those companies need to comply with new act as stated in point #4. Thanks for the additional details that you have provided in your comment. No. 4 is not at all applicable for pvt ltd companies as they cant take deposits from public. The Act and Rules expressly prohibit that. As regards No. 3, not all loans are covered by the definition of deposits. There are many many exceptions to the definition of deposits such as loans from banks or raising debentures or ECB. so no need to have any problems with that. One of the big compliance introduced is filing of MGT-14 (Form 23 in Companies Act 1956) . Scope of filing MGT -14 has been introduced so much . One needs to list out every business in BoD and compare it with section 179 and section 117 so that if anything falls in that scope. MGT 14 is filed in time. The author is spot on when he recommends good accounting practices from the start.